I finally watched the movie, Frozen, and I love it! Don’t worry, I won’t talk about it in detail to avoid spoilers for those who haven’t seen it yet. Olaf is seriously the coolest snowman ever. (I want one!) It’s a great movie with several good songs in it, but the song “Let It Go” stands out as being the one that is stuck in my head. You know a song is stuck in your head when you find yourself singing it in the shower and in the car even over the radio playing a different song. Even if you haven’t seen the movie, I’m sure you’ve heard it on the radio. 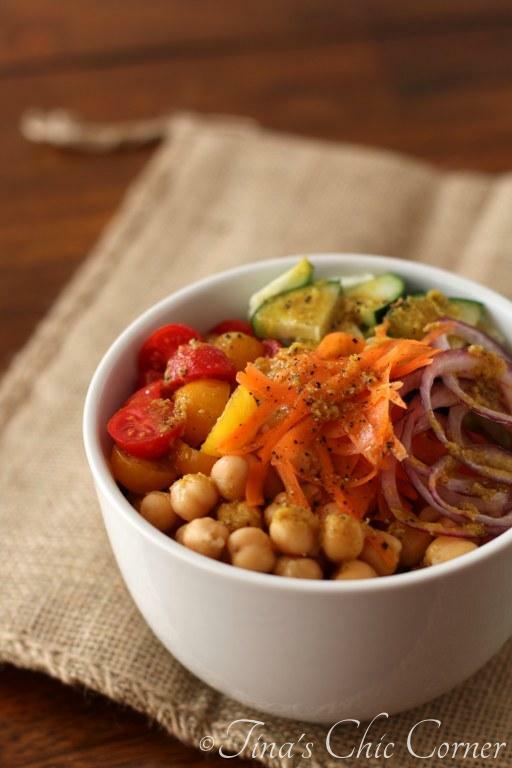 This healthy salad is is loaded with chickpeas and lots of veggies, tossed in a homemade dressing of traditional Indian spices. In a large bowl, combine the chickpeas, tomatoes, carrots, cucumber, and red onion. Pour the dressing (see directions below) over the mixture. In a small bowl, whisk together the lemon zest, lemon juice, olive oil, cumin, curry powder, salt and pepper. I love chickpeas. Who’s with me? You can do so much with them and they’re a great source of protein and fiber. Pile them up with fresh tomatoes, cucumbers, and red onions and you’ve got a really awesome combination. Raw onions? Don’t worry, the red ones tend to be mild and on the sweeter side. They add great flavor to the salad, but the best part about building your own salad is that you can put as much as or as little as you like. Truth be told, though, it’s the dressing that makes this salad super awesome. Isn’t that always the way? It’s an oil and lemon based dressing complete with delicious spices. Really like the ingredients. I love the 2nd pic. How good was Frozen!? I love kids movies now just as much as when I was an adult. Have you seen How To Train Your Dragon? It is so good too! I love chickpeas. This salad sounds so light and refreshing. Love the indian flavors in it. Tina, Olaf was the only character that really kept my little man and husband in the movie theater through the whole movie… thank goodness! Without that little snowman, they would have booked out of there the moment the singing started… boys! 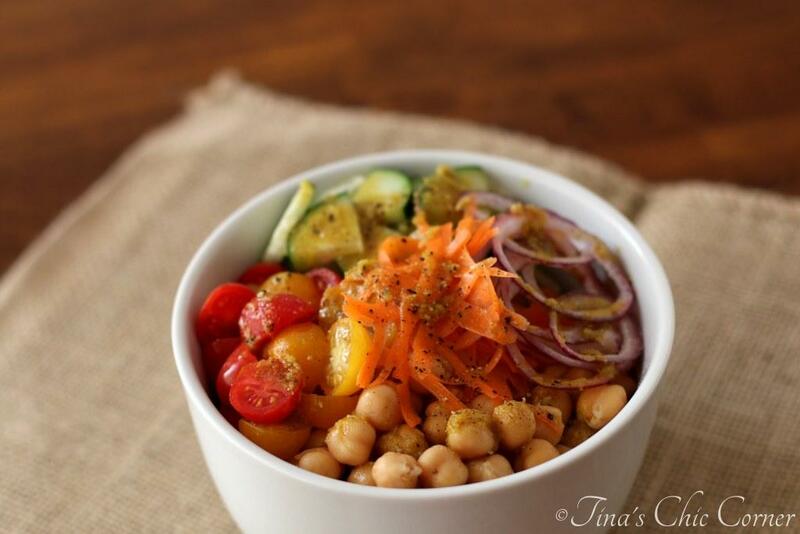 Love this salad with all the Indian flavor and chickpea action! And, very gorgeous, I might add! There’s something about this movie that captures everyone. 🙂 You always say the nicest things…thank you so much!! I still haven’t seen Frozen! I keep hearing that one song over and over but have yet to just watch it! And I love the looks of this salad – I particularly love that it’s the kind you can eat with a spoon! 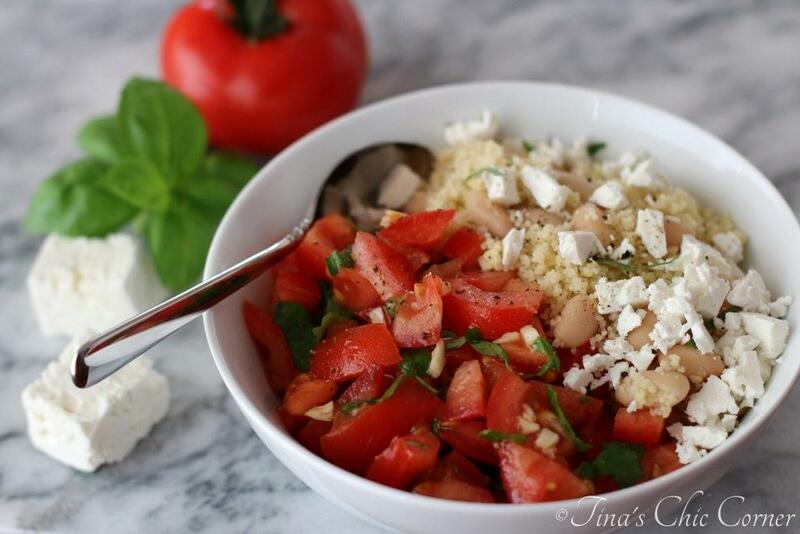 I’m totally with you on the chickpeas – I can’t get enough of them right now! I’m all about non-lettuce salads! I like greens, too, but sometimes a change is needed. Chickpeas are so versatile, which is why I like them so much. I also like Indian spices, so this salad look like a winner. I love chickpea! 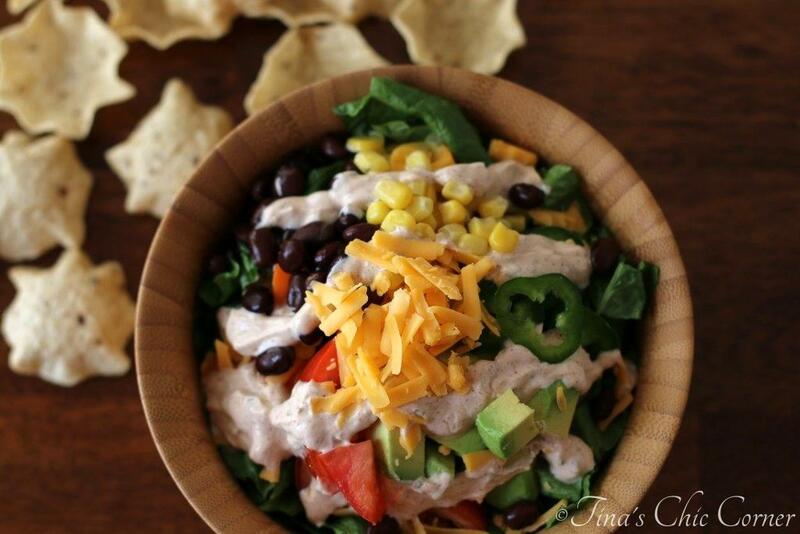 This salad looks 100% inviting Tina! P.S. Re your Frozen comment, how sad is it that I haven’t watched it, but know that song + “Let it Go” by heart? No, I don’t have kids! My nieces are obsessed with the song and movie – I’m dying to watch it yet but so glad to hear you loved it too:) I can’t get enough of chickpeas too and love the sound of this salad and all the pretty colors. Great flavors in here too – love the curry and cumin in the dressing! I’ve never seen Frozen which I’m pretty sure makes me a lone wolf in this world! I really should, eh? Love the salad. I’ve been chickpea crazy around here. Especially when they’re roasted! Tina, I have yet to see Frozen but keep hearing such fun things about it! This salad looks so cozy and healthy! I actually still haven’t seen Frozen yet, but I definitely want to! The salad looks great, and I know I’ll be eating a lot more salads like this now that the weather is warmer. I love chickpeas too, but I soak and cook dried ones which are even better than canned. I also eat salads almost every night, but they never involve greens. I like all the other ingredients so much better. I can’t wait to try this dressing recipe to mix things up! I haven’t seen Frozen, but my daughter has the DVD. I pass her room and she is just singing away 😀 It’s cute and funny at the same time. Now, this chickpea salad sounds awesome! I love chickpeas and now I need to try this ASAP. That’s adorable! My husband catches me singing the song every now and then. I don’t know what’s worse, my voice or that I make up some of the words. Hehe. I’m obsessed with chickpeas! I love them in pasta, in salads and in my summer pasta salads! Ok so maybe I just like them in pasta and salads…just realized that 🙂 haha. But this looks fantastic! Can’t wait to try it! Isn’t that such great advice …. just to be true to yourself? 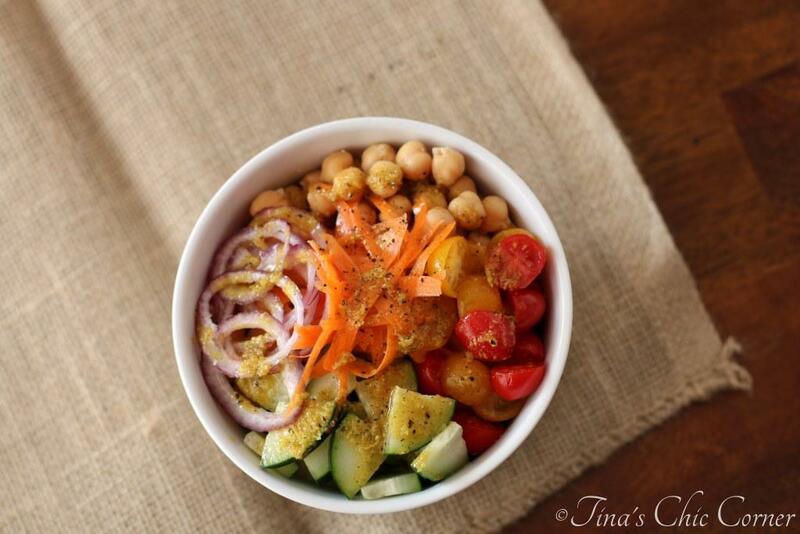 Love this chickpea-based salad as well … what a creative idea to add Indian spices! This chickpea salad looks great! So fresh and healthy… perfect for lunch! And I watched about the 1st 30 minutes of Frozen with my 3 year old niece… and then her focus went in a completely different direction hahaha. Rippa salad, massive fan of chickpeas, although if I’m cooking them from scratch, I usually don’t bother. It’s heading into winter here in Oz, but I think it’d be a nice side for a winter dish. Haha…love that! Now you’ve got me singing. 🙂 Thanks for stopping by!